That tank is so cool, Nige! I'd love to come across one of those, though it's unlikely as I live in a country where they were never used. Thanks for posting! The stripes look great Lars. I noticed the drop tank at the museum didn't mention P-47's. It mentions the P-51, P-39, P-40 and the P-63. No P-47? Did I miss something? There are so many great P-47's all in one spot thanks to this thread. And so much great info too. You guys are making it hard for me to choose between a 1/32 Mustang or T-bolt. They are both such great looking warbirds. What to do? ...What to do? Or build both I guess. 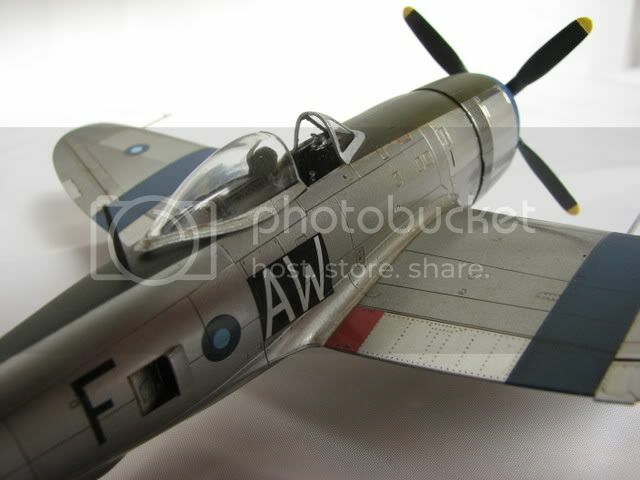 Yes its odd that the P-47 isnt mentioned on the actual drop tank, but I do have reference photos showing Luftwaffe drop tanks filled with waste oil and attached to P-47's, so I wouldnt worry too much about attaching one to a model. Its amazing whats still being discovered, both stored in barns etc and also dug up. Recently I mentioned a "special build". Now Ive finished the MUSTANG Ive cleared the bench and made a start. Its a presentation piece for the Halesworth Airfield Museum. The home of the 56FG Wolfpack and also used by the 489 BG and later by the 5th ERS. The kit is the Tamiya Razorback and its also my first ever 1:48 build. NMF is not my arena of choice but I finally completed one I'm mostly happy with. This is Hasegawa's 1/48. Built mostly OOB, I added detail to the main gear, and added a resin gunsight. Oh, and PE belts. Paint is Alclad, Tamiya acryls, MM enamels. Weather is MIG oils and pigments. Flat is Polyscale. Heck, OOB is out the window. I used Pyn-up decals from Cutting Edge. I also scratch built the cowl flaps to be shown in the open position. Somehow I managed to muck up the nose art decal on the left side. After I had it in register I noticed that the image had some spots flaked off of it. Never knew it happened until later. So we wont look at that one to closely. I'm not sure if the plane was supposed to have nose art on both sides or not but I applied it to both sides anyway. The CE instruction with the cals made no comment about it. The plane is supposed to have covers on the wheels that are painted red but I had some Ultracast wheels in the parts box and could not resist using them. I guess that pretty well kills the OOB comment. I was not aware until now how much AM I used on this build. It was fun and I have two more to build, both with Pyn-Up decals. I was looking forward to this one being complete, not so much to be done with it but to see the final product. And I just now noticed I forgot the links that attach the gear doors to the struts. Eh, maybe someday. Looks really sharp! A very nice job. So I'll throw this question out there since I have yet to build a BMF aircraft. Or NMF if you prefer. To clear coat your bare metal or not to clear coat? Probably not as simple as that but I'd like to hear what you guys think. Also, other then being very careful when trimming decals can anything be done to hide decal film? Cause you won't be able to remove it all sometimes. Think I am finally going to try a natural/bare metal finish. They can look absolutely stunning. As has been shown here with many great examples already. I reckon you ought to take some more photos without the base and get it entered in MoM! When I use Alclad I always give the model a couple of coats of Klear/Future before and after I decal. This has the double action of protecting the decals from the panel wash, and also eliminates any silvering. ( Not guaranteed with the horrible Academy Decals). After the oil wash has been applied well,,Im still experimenting. On the RAF T'bolt, I gave the airframe another couple of coats of Klear, then masked and matt varnished the blue stripes and olive drab anti-glare panel. With the Mustang, I used the same shades of Alclad and blue acrylic, also the same burnt umber oil wash.This time however, I gave the whole model a couple of coats of satin varnish. The photos were taken in the same light so this is about as good a comparrison between the two finished NMF's as I can show,unless of course you see the two models side by side. I'm with Nige on the clear coat. I used Future (Klear?) on the NMF jug above. After weathering with oils I used Polyscale flat then added the MIG pigments. None of the clear finishes made any substantial difference to the apearance of the Alclad. HK, many P-47s of the 368FG carried the nose art on both sides of the cowling. Some pilots had their nose art on the port side and allowed the ground crew to decorate the starboard side, which made for some interesting paint jobs. The 368th Fighter Group Website has literally hundreds of photographs and is well worth browsing. I couldnt find any photos of the starboard side of Sleepy Jean The 3rd on a first look. Looks like the bottom panel of the cowlings not as streamlined as Kartvelli intended. 1/48 Academy P-47N. NMF with Floquil railroad colors. Such a poor example of workmanship would be laughed out of any decent IPMS show; obviously this crew chief did not properly use his glue and the plastic melted; he should have filled and sanded it so it would look realistic. I actually considered trying to duplicate that dent. I've tried it in the past and it's hard to believe how hard it is to make damage and dents look right. After considerable thought I dropped the idea. Nige, that shot actually comes with the decal set. Neat to see a bigger shot. LOL! You should have seen my Apache from many years back. Thanks for the info on the clear coat guys. And Fred, I love the N model. Yours looks wonderful. Hey Allen. Where did you get the decals with George Rarey art work? I wonder what they have in 1/48 or 1/32? Recently Rowan (Merlin) was kind enough to send me a couple of Eduard PE Sets for the Hasegawa 1:32 Bubbletop to review. There are some absolutely stunning Tbolts here. You all do wonderful work. The Thunderbolt is one of my favorite fighters. Im glad you found our little P-47 club. I hope your going to join in the fun and post some photos of your work. The forums are the heartbeat of Aeroscale. 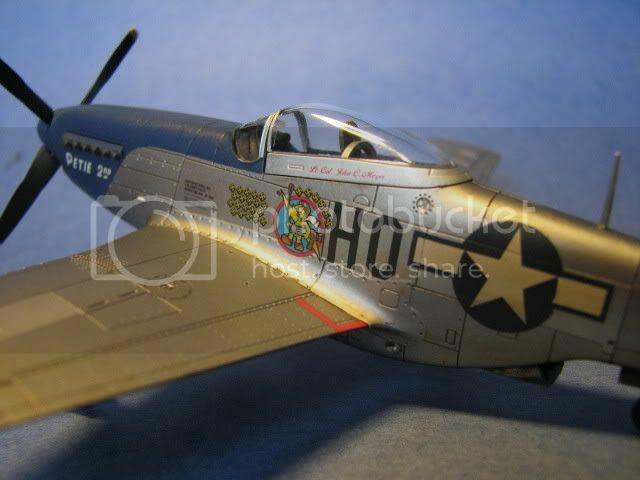 Seeing as how the forums are as quiet as a doctors waiting room at the moment Ive decided to start the Trivia Question branch of the Aeroscale P-47 SIG. So,,here we go with question #1. The first aeroplane shot down by a member of the 56FG "Zemkes Wolfpack" was a ....................................?? A "190"? Either that or a "109"? Or are you trying to get real specific? My first contribution to the P-47 SIG is... a question! Your P-47 was flown by Lt Albert Knafelz. Whats not helped your quest for information is the probably incorrect serial number on the decal sheet. My research shows it to be 422629 8. As for pictures..hopefully these will help. What were the specific references you were looking for Jean-Luc? Well, for a start, the pictures you've posted for example! Thanks a lot! I wanted to know how the green camouflage patches looked like. Hard or soft edges like on the profile. I have the answer now: very soft edges! I also wanted to know how the D-Day stripes looked like. It seems that the ones on the rear fuselage top have been covered with fresh Olive Drab (see profile). What about the upper wings stripes? For the serial number, do you mean I should replace the 0 with an 8? All the references I can find point to the correct serial number being 42-26298, although I havent yet found a photograph to support this. As for the "invasion stripes". I would think that if the upper fusalage stripes had been painted out that the upper wing ones would have recieved the same treatment. Again,,I havent found any photos to prove this. You can see it at the bottom of this combat report dated July 4th 1944.